Webinars are the new speedy and cost-effective way to create buzz for you and your business simultaneously creating a list of reliable admirers. New let’s have a look at the 3 steps to produce high-quality webinars using your blogs. So what is the best way to increase your profit proportion? The very thought that strikes you is your blog. Many can have a doubt if your blog can help you with this tracking down. Yes it is practically possible, your blog can turn out to be the right path not only in popularizing your topic, when channelized and handled the right way, can lead you to extremely large benefits that you could ever imagine. With this you not only create your fan base, but also rise to a trustworthy level. What can be the best way to intermingle and bond to your readers more than your blog? Leave off your confusions, put it right on your blog post and ask your fellow readers- they can point out the challenges and assist you fix on your topic. Of course, this is a smart move in knowing what your market demands even before you launch it and then confer what they fancy. Once you have finalized on your topic, have in mind that it was one of the most requested. Make it visible to your listeners, detail what the topic covers- why is it essential for your readers. Elucidate and specify the benefits and clarify the after effects of the benefits. Leave no stone unturned- this is sure to turn out to be your winning shot many a times. Post your webinar registration link and the time details in advance and make sure it reaches all your readers at the correct time. Also persuade your readers to spread words about the webinar through giant social media platforms like face book, LinkedIn & twitter. This is as simple as this! Every move of yours can take you closer to your viewers when acted elegantly. Build big deals and strengthen the relationship you have by now created with you blog readers. Never disappoint even the audiences who have missed out your live webinar. 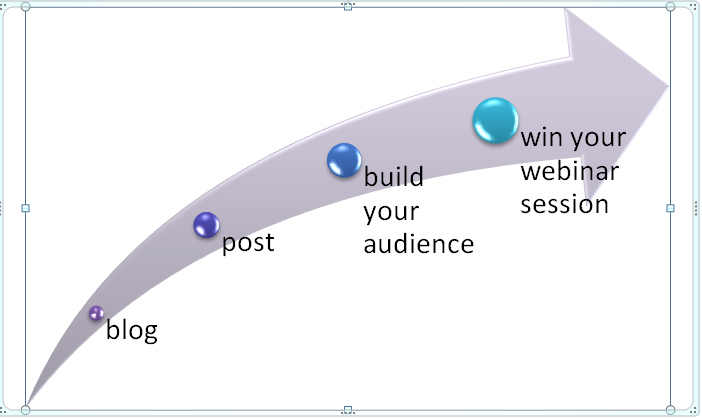 Ensure you have the option to view your webinar at your blog anytime they wish. Whatever be the reason, having a rerun is a stylish move and this can pay way for more sales and acquire you a mammoth fan base. Never forget to inform your reader about the play again option. Connect and link with clients. Trademark yourself and your business. Get the firm repute you ought to have. Grow to a name reliable of buying from.